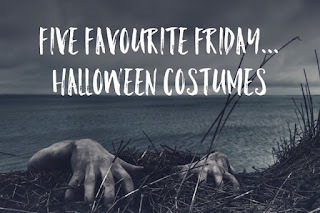 I’m back with another Five Favourite Friday post (but not with the subject I’d anticipated) and with it being Friday the 13th I’m going through my favourite Halloween Costumes. Although I never really ‘did’ Halloween growing up (too American for my liking), but there are Costumes that I think suit the celebration. In recent years Nikki has dragged me along to grownup Halloween parties and I’ve made (a poor) attempt at dressing up, first as a zombie patient and then a vampire, but there are much better options out there that will be included. ‘Hairy’ Potter - An overly hairy person throwing their clay, an apron and additional hair can make this a quick costume that can be cobbled together at short notice. Cereal Killer - A simple costume where you affix cereal box covers to your clothes, then walk around with your weapon of choice, fake of course! French Kiss - stereotyping the French, by wearing a beret and striped shirts with black and white Kiss makeup. Ginger Bread-man - Dress up as a baker and add a ginger wig, easy. I think what makes them scary is the fact clowns exist and, extenuated by films like ‘It’ [1990 & 2017], there is something inherently creepy about clowns. It’s not difficult to see why some people have a phobia of them (Coulrophobia). A bit like my next favourite, I think you’ve got to throw yourself into being a creepy clown, otherwise you’re just not scary! A staple of Halloween costumes and relatively easy to pull off (some people naturally have an almost dead complexion). But as with most of these, the more preparation that you put into it, the better it will look in the end. One of my favourite mythical monsters and quite an easy costume to make with a bit of additional fur here and there. You can always hope that Halloween isn’t a full moon and you can just go in casual clothes and say you’ve not been affected by the moon’s rays! Another costume that can be done quickly by doing with bits you may have lying around the house (a white sheet with eyeholes) or going full on with ghostly makeup and wearing mute clothes that make you look like your from the Victorian era. I hope this inspires you, if you’ve got any favourite Halloween Costumes that you love let me know in the comments below.